January is the time when industry leaders come out with their lists of top trends for the upcoming year. The National Restaurant Association predicts locally-sourced meats and alternate sources of protein will be the year’s top food trends, for example, while Vogue says that ugly sandals and the “Markle Sparkle” will rule the runway. The trendy folks at Content Marketing Institute (CMI) have released their B2C Content Marketing 2019—Benchmarks, Budgets, and Trends based on a global survey of international companies representing a full range of industries, functional areas, and company sizes. The report details the answers provided by 299 respondents identifying themselves as primarily business to consumer (B2C) companies. While it may not have the sparkle of trends regarding Meghan Markle, the CMI report is of special interest to B2C organizations hoping to increase their bottom lines through content marketing. To compete and succeed in today’s marketplace, companies and organizations of all sizes need to give consumers what they want. The best way to do that is to evaluate the trends of the previous year and predict which trends will continue over the course of the next 12 months. Based on information gathered in the 2018 survey, here are a few of the hottest content marketing trends in 2019 and their important takeaways. Fifty-seven percent of B2C marketers surveyed said they expected their content marketing budgets to rise in 2019. Of those respondents, 29 percent predicted those budgets to rise more than 9 percent. Trend takeaway: Your competitors are increasing their content marketing budgets – shouldn’t you? The B2C marketers said they increased spending on content creation by a whopping 56 percent last year. Marketers also increased paid content distribution by 37 percent, invested 34 percent more in both content marketing staff and content marketing technology, and 23 percent in content marketing outsourcing. Trend takeaway: Plan on spending more on content creation, marketing and distribution in 2019. Getting what you pay for is always in style, so B2Cs expect get a consistent quantity of higher quality content for their investment. This high quality content improved customer experience, rewards loyalty and results in more conversions and sales – and it seems to have worked in 2018. Seventy-nine percent of the CMI respondents said that their content marketing efforts created brand awareness, 67 percent reported it built credibility and trust, 63 percent claimed it built loyalty with existing customers and clients. Perhaps most importantly, 57 percent said content marketing generated demands or leads, while 52 percent cheered about the sales and revenue content marketing brought them in 2018. Trend takeaway: Ramp up the quality of your content to increase your return. The readers’ informational needs will be more important than the sale or promotional message, according to a whopping 66 percent of the CMI respondents. Respondents of the CMI survey listed the content marketing issues of most importance in 2018. An overwhelming 63 percent said that changes to SEO and search engine algorithms were a top content marketing issue in their organization, and another 59 percent said they were concerned with social media algorithm changes. They have good reason to be concerned about these algorithm changes, as Google makes changes that affect search results an astounding 500 to 600 times each year, according to MOZ. Trend takeaway: Stay up to date on changes to algorithms, or hire content marketing experts who know how to deal with these changes as they happen. The results of the CMI survey show that the longer an organization uses content marketing, the more likely they are to enjoy success. 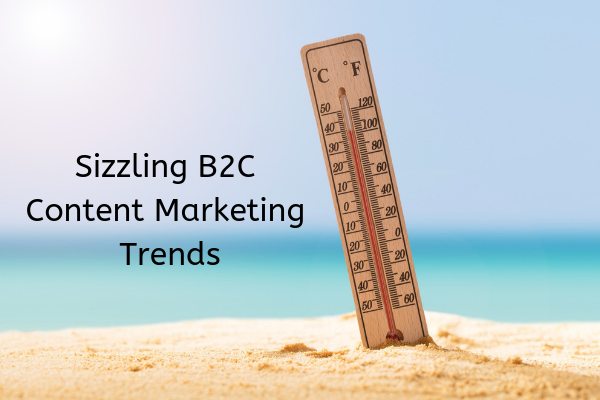 More than 31 percent of the B2Cs viewed their content marketing as “mature” and successful. Trend takeaway: Stick with it – the longer your organization moves towards content marketing maturity, the more likely it will perform better. Once upon a time, companies started using storytelling to connect with consumers on a personal level. Many credit the John Deere Company as being the first to use corporate storytelling with the 1895 publication of The Furrow, a magazine that educated farmers on farming and business practices rather than selling them agricultural equipment. We take a humorous look back at this in Why You Need a Sales Writer. Storytelling remains an important approach to content marketing today. Half of respondents of the CMI survey said that their organization now uses storytelling in its creation, either all of the time or frequently. Trend takeaway: Create your own Markle Sparkle through storytelling. Give your organization its own Markle Sparkle this year by taking advantage of some of the hottest content marketing trends in 2019. Evaluate your company’s content marketing strategy, consider expanding your content marketing investments and look for ways to incorporate storytelling in your blogs, articles and social media posts. Ugly sandals are optional.